The EU is forever claiming to be responsible for peace in Europe, and this claim is still repeated by Remainers in the UK. In fact it has been NATO that has fulfilled the role of defending Europe. The EU didn’t even exist until 1993 when the Maastricht Treaty was signed, 48 years after the Second World War ended. Since then, amongst EU countries, it has been the UK which has been the lead country in defence, as it has been since WWII. In 2018, the UK was the only EU country predicted by NATO to be exceeding official NATO targets for defence spending – as a proportion of GDP and in terms of its percentage spend on military hardware. None of the other member states managed to beat both targets. Not Germany, not France, not Italy. Not even Greece, which has traditionally been a high spender as a result of its continuous disputes with neighbouring Turkey. When it comes to the headline which most people are aware of – the minimum 2% target of GDP – just 3 out of the EU countries beat the target : the UK, Greece, and Estonia. The small Baltic countries such as Estonia have recently increased their military spending as a result of the threat from neighbouring Russia, but their overall expenditures are of course low. Germany, which of course could make a huge difference, is languishing on just 1¼% of GDP and Mrs Merkel has only promised to address this by 2025. In committing to increase the GDP percentage, this will only be for future years and Germany plans to do nothing about its accumulated shortfall over many years. Given that Germany is now teetering on recession it seems highly unlikely that it will even meet its promises on an ongoing basis by 2025. Austria, Cyprus, Finland, Ireland, Malta, and Sweden are not members of NATO. This leaves just 22 EU member states which are also NATO members, and this will fall to 21 when the UK leaves. As the EU continues to move rapidly in its creation of an EU army, the absurdity of the claim that the EU has been responsible for the peace in Europe grows too. 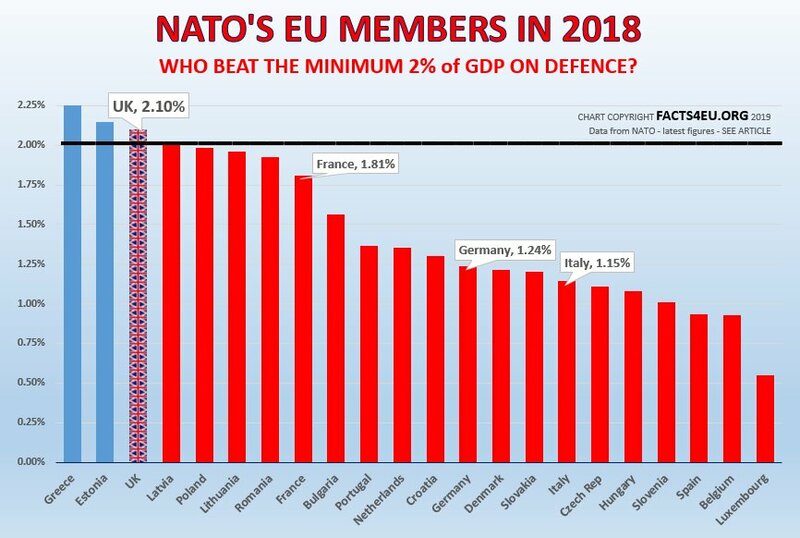 For decades the vast majority of EU member states haven’t even been capable of meeting NATO’s minimum spending requirement, first set out formally in 2006 and subsequently reinforced at the NATO conference of 2014. The idea that these countries are going to be capable of defending themselves under the EU military structures they are busy creating is simply laughable, in our view. No wonder they are keen on Mrs May’s promise of a full and comprehensive defence treaty as part of the Brexit negotiations. [ Sources: NATO ] Journalists and politicians can contact us for the full list of links, as usual. 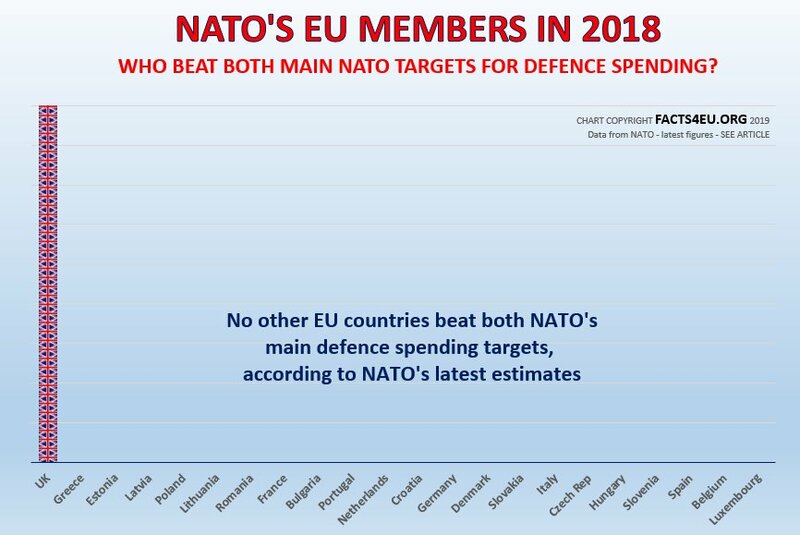 No wonder the EU did not like Trump pointing out the EU's overall appalling contribution to NATO. Take the UK out and it's even more pitiful. Thank God for Trump! I only wish the UK had a similar strong person as PM. Look to Hungary too where their foreign minister Péter Szijjártó has said “We consider border protection as an obligation of the state, because it is an obligation of the state to ensure the security of the country and the security of the people". This should be a sacrosanct and unchangable element of Government, but when one sees what Labour/Liberals/Conservatives have done in the last 47 years since joing the eec, then one needs a sick bag close by especially when you think of open border madness.